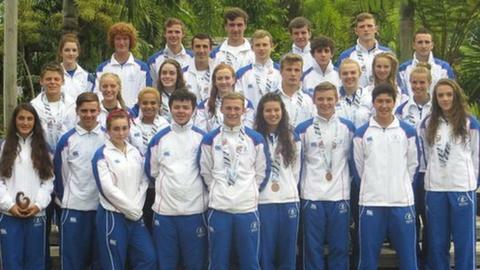 Scotland's young athletes return from the Commonwealth Youth Games in Samoa on Monday with 21 medals. The medal haul by the 28-strong team led Commonwealth Games Scotland chairman Paul Bush to describe the group as "one of our most successful teams to date". Comparison with other Youth Games is tricky because of the numbers of countries involved each time and the size of the Scotland team at different games. However, the Scots can return in buoyant mood and the athletes will now look to progress into the senior ranks - 66 previous Youth Games athletes have gone on to win 32 senior Commonwealth medals for Scotland. Boxer Charlie Flynn, swimmer Hannah Miley and runner Lynsey Sharp all cut their Commonwealth teeth at the junior games. Flynn credits the 2011 Isle of Man Youth Games experience of being part of a national squad at a multi-sport event as helping him win gold in Glasgow three years later. Scotland entered teams in eight of the nine sports in Samoa: aquatics, archery, athletics, men's boxing, lawn bowls, squash, tennis and weightlifting (but not rugby sevens. The first Commonwealth Youth Games were held in Edinburgh in 2000, followed by Bendigo, Australia in 2004, Pune, India in 2008 and Isle of Man in 2011. Scotland won 21 medals in Samoa - three gold, 10 silver, eight bronze. Eighteen of the 28-strong team return to Scotland with medals. Bush said: "The popularity and standard of competition at these Games has grown massively over the last few years and they are proving to be the ideal launch pad for athletes to move on to senior international success. "We now look forward to seeing many of these names move on to make their mark in Gold Coast 2018 and Durban 2022." Following in Flynn's footsteps, all four of Scotland's boxers won a medal in Apia, the Samoan capital. Sean Lazzerini, and John Docherty, both 18, won gold medals while Billy Stuart, 17, won silver and Kieran McMaster, 18, won bronze, which, he said, was "not bad for a boy from Crosshouse". There was a wave of medals for the swimmers too. Scotland's first gold of the games was secured by 16-year-old Erin Robertson from South Ayrshire in the 50m breaststroke and that was added to in the pool by three silvers and three bronze. Robertson said: "It was amazing to stand on the podium and see the Scottish flag up the top and hearing the Scottish national anthem being played for the first time, it was everything I dreamed it would be." And Scotland's athletics squad managed an impressive sweep with the entire team coming away with medals - three silver and four bronze. There were silvers for 17-year-olds Carys McAulay, in the 800m, and George Evans in the discus and a second medal for Alisha Rees, 16, who put in one of her top performances in the 200m, going below 24 seconds for only the second time in her career. She said: "I couldn't have asked for any more from myself. Everybody in athletics got a medal so that's pretty amazing. I've enjoyed the experience so much." With top finishes for the rest of his team, Perth's Ben Greenwood, 17, was still surprised when his turn on the 800m podium came. "I didn't expect to get a medal here but I was feeling the pressure a bit, thinking this morning that everyone in athletics has got medals so far," he said. "It's a bit unbelievable to get a medal." With all other competitions finished, Team Scotland were out in force on the final day to support their team-mates in the tennis. Glasgow's Ewen Lumsden, 15, won silver in the boys' singles and collected another with mixed doubles partner, 17-year-old Louie McLelland of Stirling. The Scottish pair also had success in the mixed, although no medals were handed out since they partnered with players from Cyrpus and Barbados. Lumsden said: "When I came here I probably didn't think I would make it to the final. "It feels good to come away with two silver medals. I'm happy to have some medals of my own after seeing others coming back with theirs and I enjoyed having all my team-mates out supporting me today." Team-mate McLelland was very happy with their performance, the first time as a doubles pairing. She said: "It's definitely one of the best moments of my career and whatever I do next I'll feel a bit more confident in myself. I'm so proud to be Scottish and so happy to represent my country." There was also silver for archer Eugenia-Helen D'Arcy, 16, and another in weightlifting courtesy of 17-year-old Biatrice Gabell. The efforts of the Scottish athletes put them 11th in the table, some way behind Australia, the most successful nation, with 24 gold, 19 silver and 19 bronze. They had a day to soak up the South Pacific sun before the flight home, time to ponder the Gold Coast Games in 2018 perhaps.